Each place is arranged by area of London, and you'll be able to see details on the type of cuisine and menu in the details below the establishment names. Living further North, North and East London options are pretty well represented, but there are a few South and West options too. *Some restaurants have multiple locations or are part of a temporary market, so I've sorted them by where I tried them. 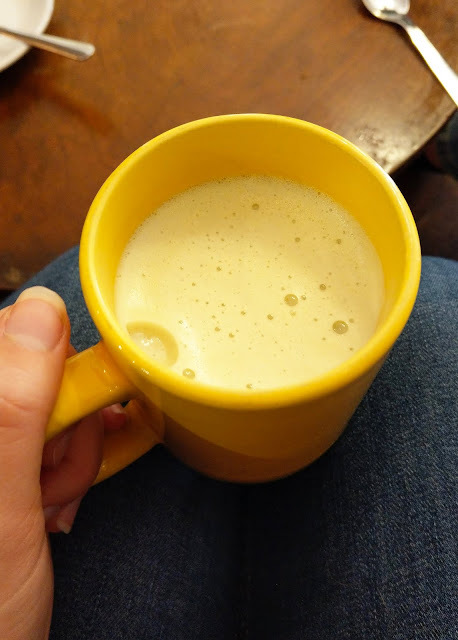 Probably the best matcha latte I've had in London, made with oat milk to the perfect sweetness, temperature and complete with must-have-ingredient, cinnamon. This little coffee shop is the perfect place for a catch-up or to bring your laptop and do some work. Serving up vegan breakfasts, soups, salads and sides, with branches in Stoke Newington and Crouch End, the haberdashery is a lovely place to spend a weekend morning with friends. Complete with a range of teas and a fresh juice bar this place is healthy, delicious and super vegan-friendly. 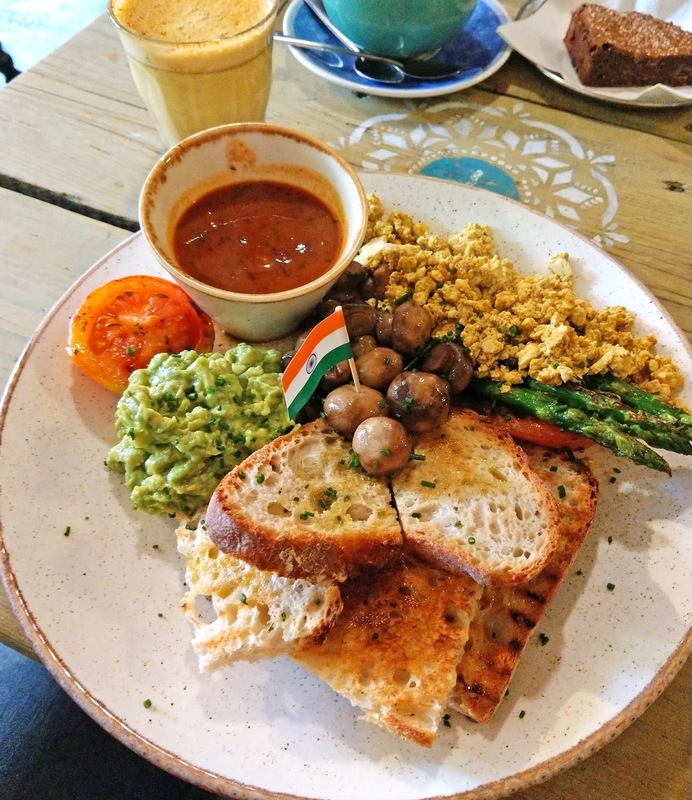 I had the vegan breakfast of scrambled tofu, polenta, tomato, spinach, mushroom and wholemeal sourdough. A vegan-friendly Indian cafe with a branch in Tottenham and one in Finsbury park, serving up a few options including homemade beans on sourdough and their 'full Indian breakfast', loaded with delicious veg, I ordered mine with an almond milk turmeric latte. 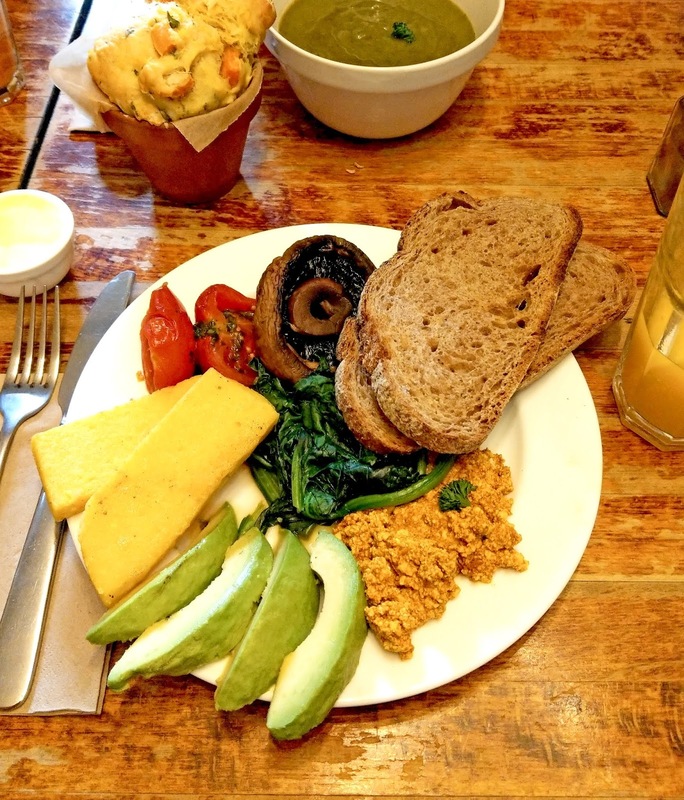 Blighty is a great place for brunch, catch-ups and even getting a little work done. Earthling Ed's latest venture is this Hoxton based diner, where all profits go towards the funding for animal rights organisation, Surge. From weekend brunches to weeknight meals and desserts, this stunning decorated, dog-friendly diner is one to return to. 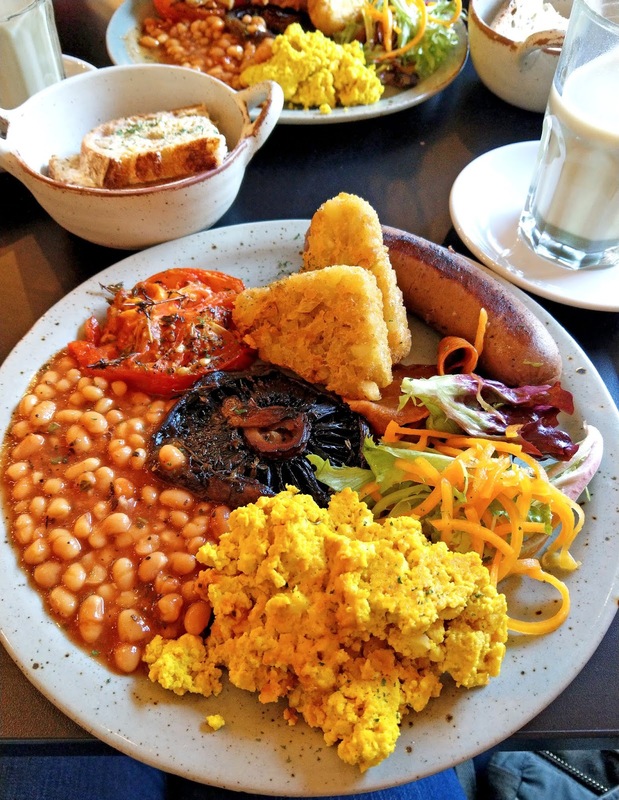 The Full English had everything you'd want; seitan sausage, bacon, scrambled tofu, grilled portobello mushroom, marinated grilled tomato, beans, the crispiest hash browns, sourdough and a spiralised carrot salad. They even nipped to the shops to make sure my breakfast was complete when they realised they'd run out of brown sauce - it was such a lovely gesture and was the cherry on top of the icing for this place! I would definitely return time and time again for the breakfast and I also can't wait to try some options from their main menu. Located near Kings Cross is this 100% vegan - self-branded - junk food shop. This place is your hungover self's dream, with lots of carb-heavy and fake meat options. I visited the day after my work's Christmas party and the vegan fish finger wrap with coleslaw and a side of cheesy chips went down a treat (would 100% order again!). They also have a few fridges and freezers with vegan items to take home for sale and a whole array of cakes and sweet treats. A veggie, not for profit yoga cafe in Tottenham. 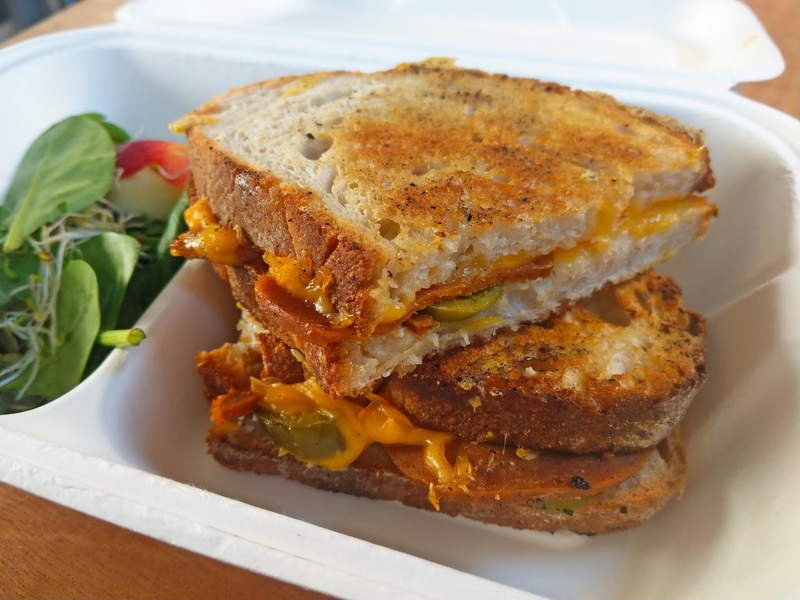 Pictured below is a vegan cheese toastie with chorizo and jalapenos. 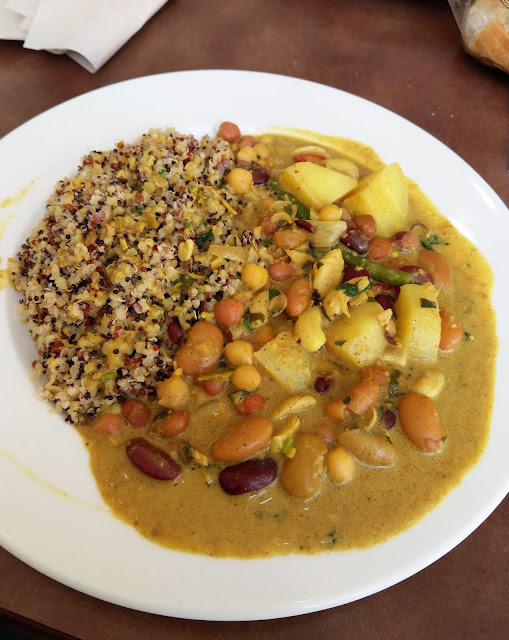 The cafe also boasts a healthy menu full of juices, smoothies, teas and plenty of vegan options like toasted sandwiches, porridge, salads and breakfast plates. It's a rare find in Tottenham and should definitely be embraced! London's own exclusively vegan pie and mash shop, with a permanent location in Camden market and a whole range of pies from their all day breakfast, to their seitan and ale. Choose from mash, minted peas, mac and cheese, cheesy chips and gravy as sides and if you're really craving some pie at home you can order via deliveroo or buy their frozen pies online to cook up yourself! 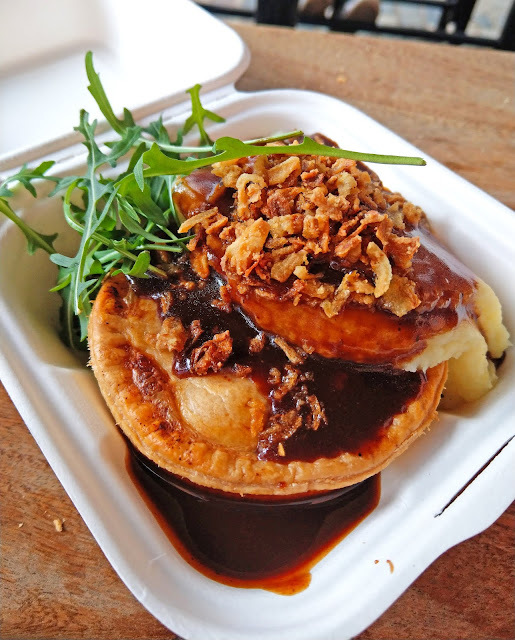 Pictured below is their bbq chickn pie with mash, gravy, crispy onions and a little rocket. 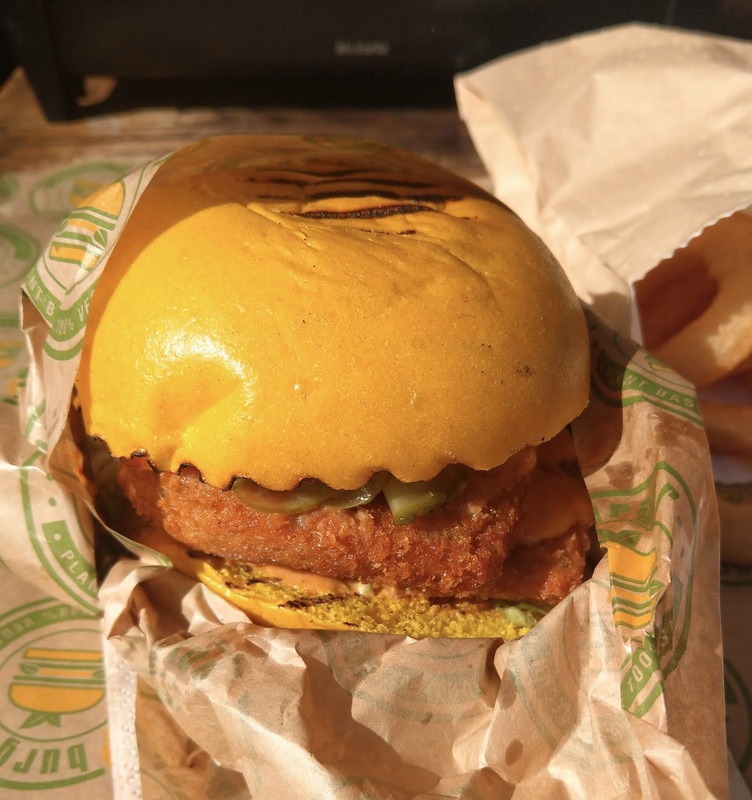 Pictured below is the seitan schnitzel burger with a side of onion rings, from Camden vegan burger joint, V burger. Other options include the Moving Mountains B12 burger as well as a falafel or a beet patty with a range of sides and dips. 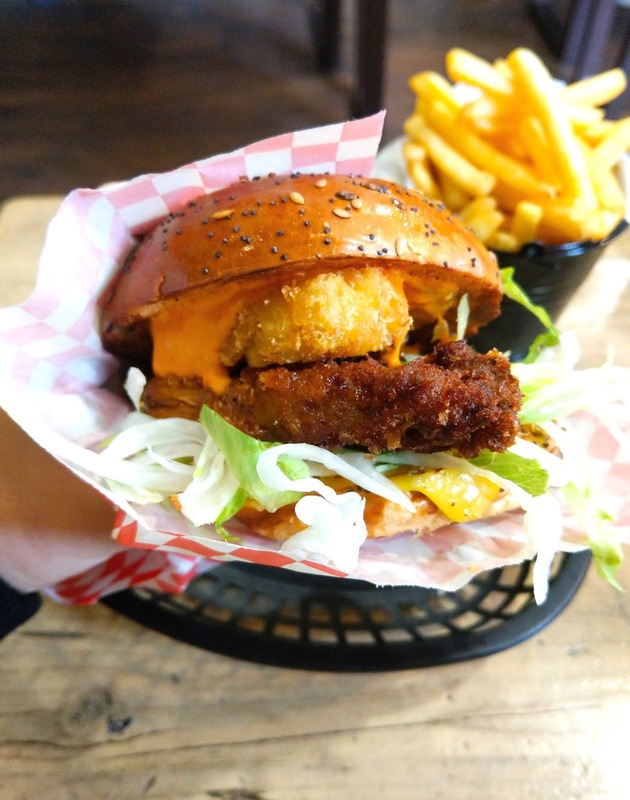 In the heart of Camden Market, V burger is the perfect place to fulfil that burger craving, whether you're into fake meats or veggie burgers. With a number of locations around London serving vegan options and one exclusively vegan branch in Kentish town, this risotto ball themed restaurant was on my must-try list for a good while. From breakfast pots to burgers and bowls, there's something for everyone. 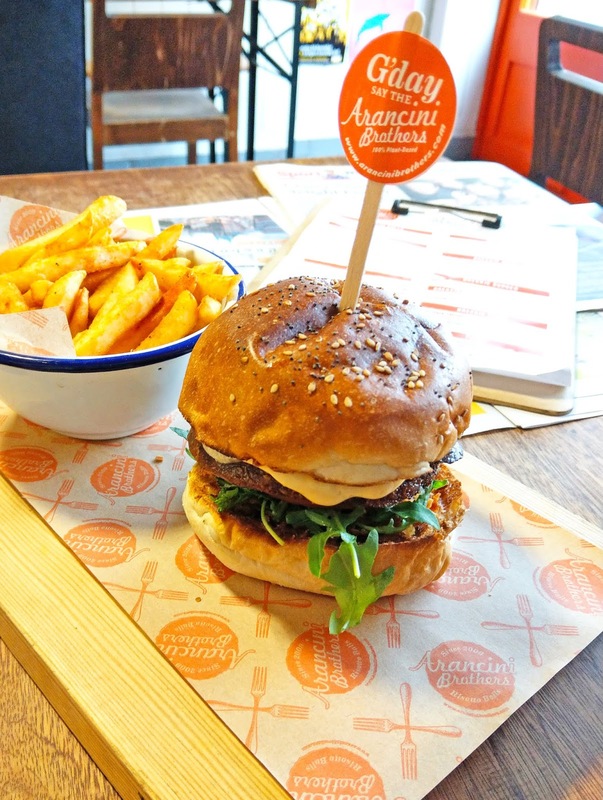 I tried the bbq mushroom burger, an arancini patty with vegan cheese and rocket, served with paprika fries and it was delicious! Formerly the Hawmaran Cafe, this family-run Camden establishment holds a special place in my heart. It's pretty cosy inside, but just feels so homely and welcoming. 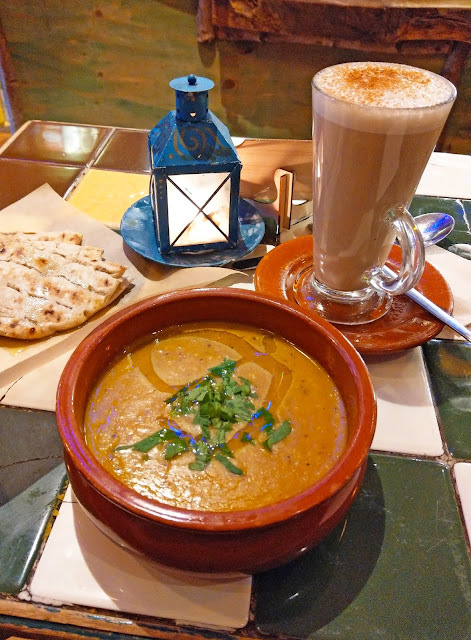 They have a number of vegan options including a falafel plate and daily grandmas soup, served with a flatbread and drizzled with olive oil, which is always incredible! The hot chocolate made with almond milk is delicious and you just have to try the almond milk chai latte, pictured below. It's just down from the hustle and bustle of Camden market and is a lovely peaceful spot for a break in such a busy area. They also have vegan brownies and a few other treats. A vegan-friendly pan-Asian chain restaurant with clearly marked vegan options, I visited the Islington branch, but they have a number of locations in London. 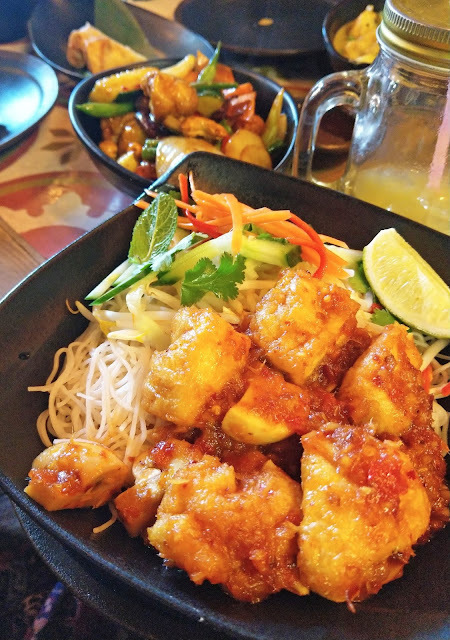 Pictured below is the lemongrass tofu, with a side of stir-fried veggies and spring rolls. Great for lunch or dinner and available for delivery in some areas too. Fresh and flavourful, you really can't go wrong. Tacos, tostadas, tamales and a whole authentic Mexican vegan menu to choose from, Mestizo is the perfect place to catch up with friends, share some food, laughs and a few drinks too. Pictured is the tostada, mushroom and sweetcorn taco filling and an assortment of dips. The food here was so tasty and I've just got to go back for some tamales. The restaurant gets pretty busy, so it's worth booking a table. With half the menu filled with interesting and delicious vegan options, this Islington-based Vietnamese restaurant is one to go back to time and time again. It's worth booking as they get quite busy and this place is great for both lunch and dinner. 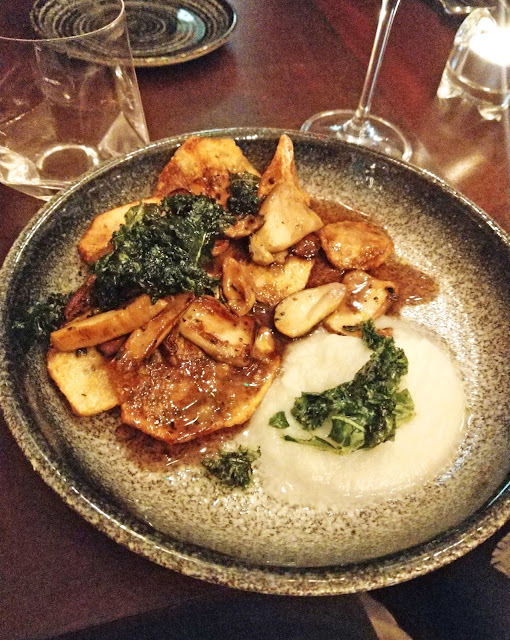 The menu is incredibly priced, but don't let that fool you into thinking the portions aren't generous - my recommendation is to order a few things between your group and share them so you get to experience more of the incredible menu. The cocktails are also pretty great. 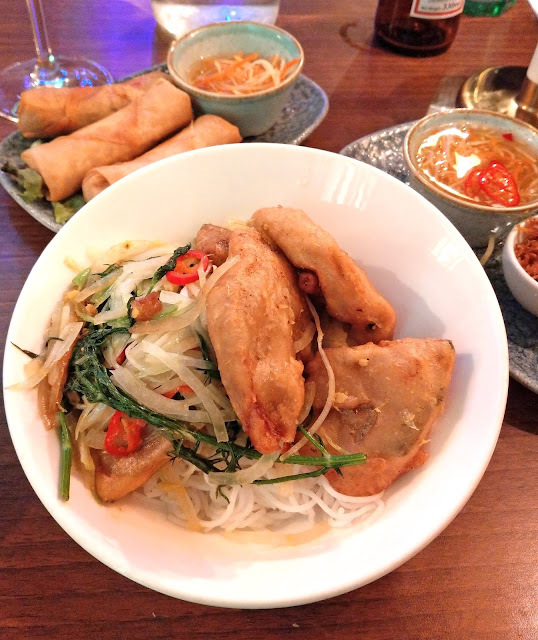 Pictured below is the ha noi fish - seaweed and dill marinated battered aubergine, spring rolls and the bun sa - veggie chickn with lemongrass and noodles. I was curious to try the veggie chickn, but being more of a tofu fan, I would probably order the dish with tofu next time. I'd had great recommendations about this Stoke Newington veggie restaurant from friends and whilst the food itself couldn't be faulted, the experience, unfortunately, left something to be desired. The menu has been carefully designed and each element on the plate thought about, so the flavours were delightful, the portions, however, were on the smaller side, despite being a little more pricy so it's worth ordering a little more than you need, or a side of bread. Our (incredibly delicious) food was served up when it was ready, which unfortunately meant a 40-minute wait between mine and my friends' mains, so we were sort of longingly looking at the other person's plate whilst we each ate individually and then we all left a little hungry, even after a 3-course meal each. Perhaps this is more of a special occasion rather than a meal with friends kind of place, so when you check it out, book a table, clear your evening, share each course and enjoy the experience together. 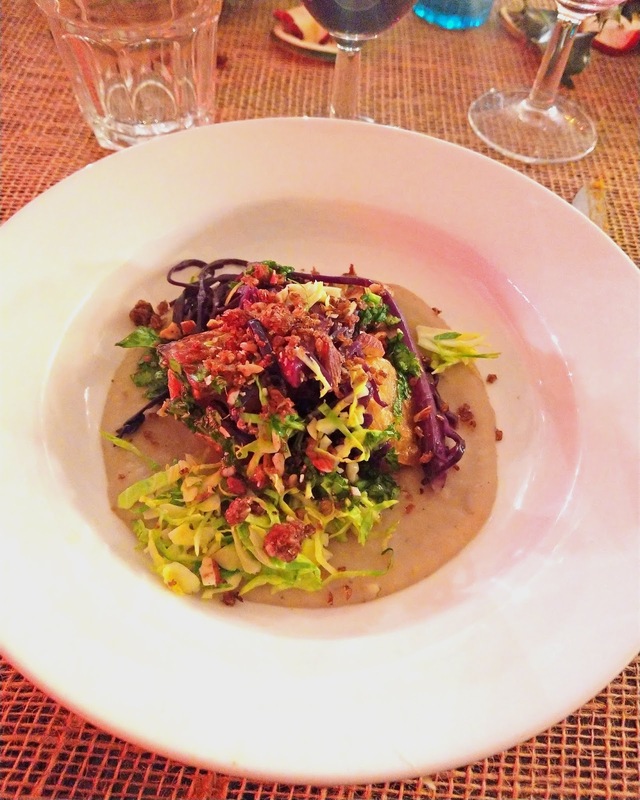 Having first tried Slaw Food at a supper club before Christmas, I'm so pleased that Anthony now has a permanent location in Islington. Full of healthy yet exciting vegan food, featuring layers of flavour and texture that is just absolutely stunning and can't be faulted. The supper club was a 5* experience and I can't wait to see where this journey goes for Anthony. 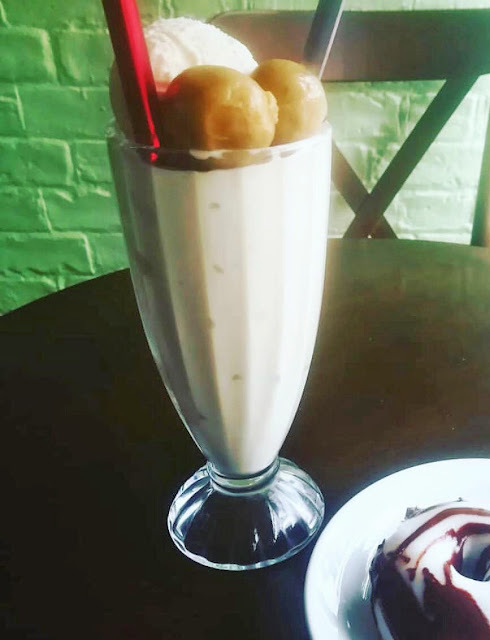 With a shop on Holloway road filled with extravagant vegan treats such as cookie dough milkshakes, wookie bars, brownies and so much more, visiting Cookies and Scream is a must! I first tried cookies and scream at their Camden market location, sadly after the market fire they never re-opened in Camden, so do make sure to give their shop a visit! The picture below is courtesy of my friend Mo as I somehow don't have a single picture from this incredible place. All hail seitan! 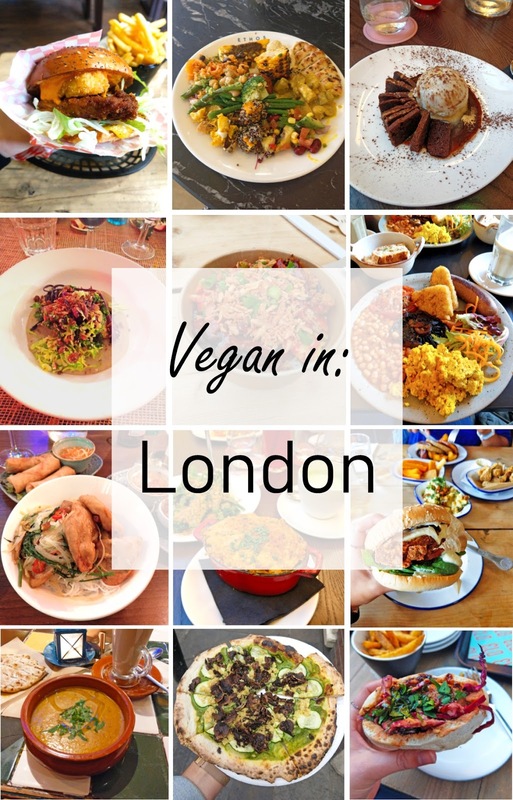 Arguably one of London's most famous vegan places, think of it as the vegan version of KFC. With endless options made from seasoned wheat gluten (the protein from wheat), their vegan chicken is one of the best around, served up as wings, burgers, wraps, you name it and be sure to check out the sides - mac and cheese, fries, coleslaw, gravy. 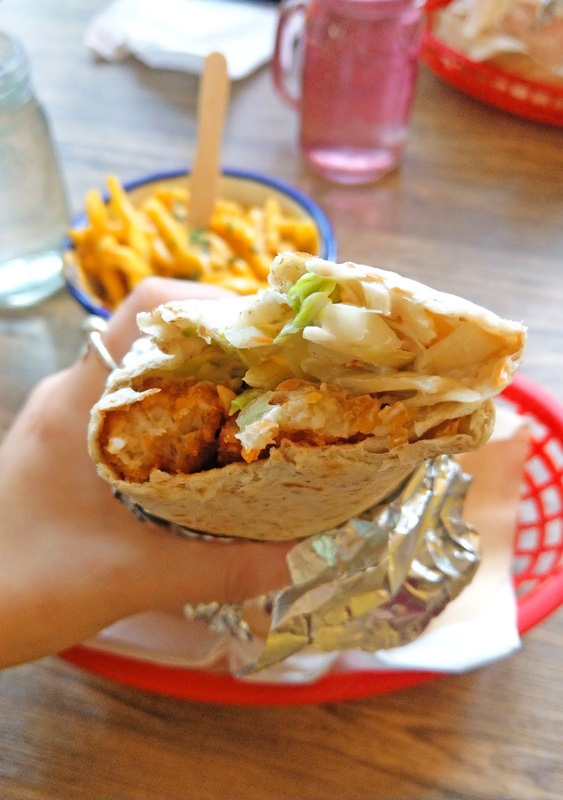 With a couple of main locations; a takeaway shop in Hackney and a larger sit down establishment between Camden and Kings Cross, as well as the odd appearances at a weekend market, it's pretty easy to get your hands on some of their seitan. And if you're gluten-free, not to worry, they even have a non-seitan option for you! This box park located delight serves up the tastiest Asian street food; bao buns, noodle salads, rice bowls and bahn mi, Eat Chay is a must-try! 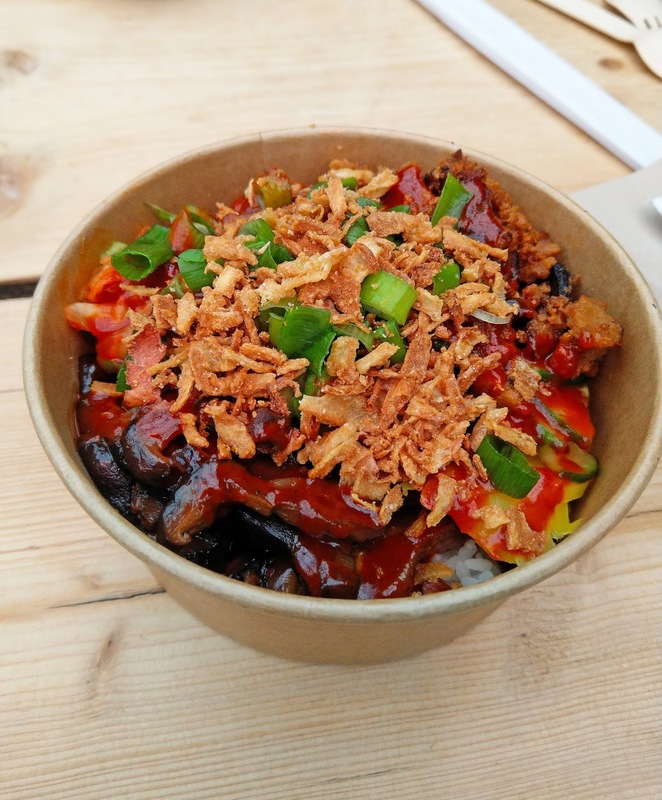 Pictured below is the bibimbap, Korean mixed rice, BBQ seitan, kimchi mushrooms, pickled veg and seaweed, topped with crispy onions. There are so many incredible places to eat at the Shoreditch box park, but I find myself gravitating to Eat Chay everytime, with their perfect balance of salty, sweet, spicy flavours and mix of chewy, crunchy and melt-in-your-mouth textures. 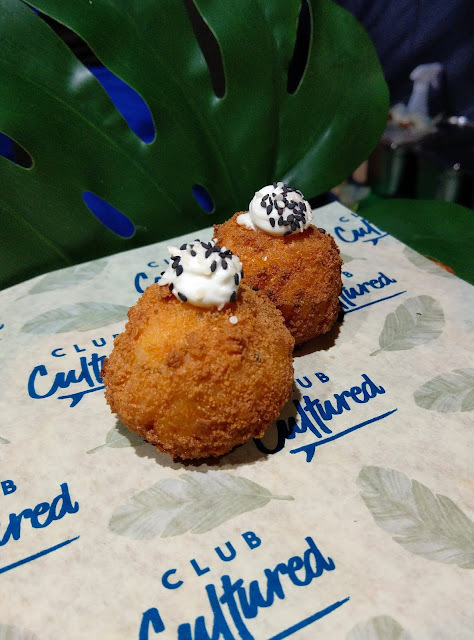 This Caribbean-inspired vegan cuisine is served up at pop-ups and markets, so be sure to keep an eye out for them. 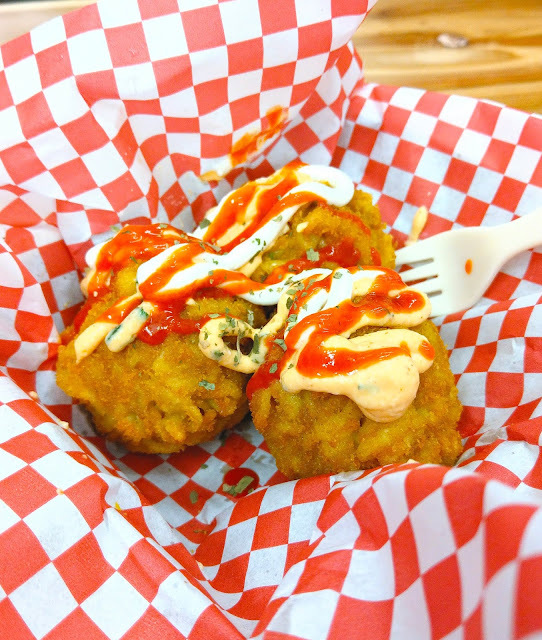 I've heard great things about their fish burger and roti; pictured below are their mac and cheese bites, topped with sriracha and mayo, which were super indulgent and delicious! 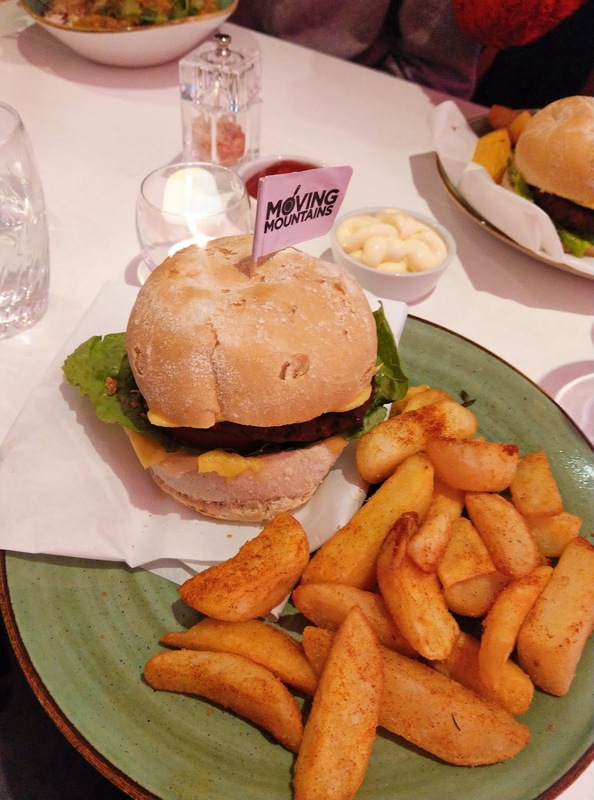 Mooshies is a vegan burger bar in Shoreditch and probably serves my favourite burger; if someone asked me to pick a burger place, it would be this one, every time. Mooshies focus on whole food based patties made of beans and veg rather than fake meat, but their show stopper is the magic mushroom burger - panko crusted oyster mushrooms with sriracha mayo and a crispy hashbrown (I also added cheese to mine). It started off as a monthly special and has recently made it onto the full menu. This burger even inspired me to make my own oyster mushroom bites, seen here. The mushrooms have such a lovely outer crunch and then chewy, juicy texture that means you just can't go wrong with this burger. This vegan Filipino place had been on my to-try list for a good while and I finally got the opportunity to try it at January's vegan nights. 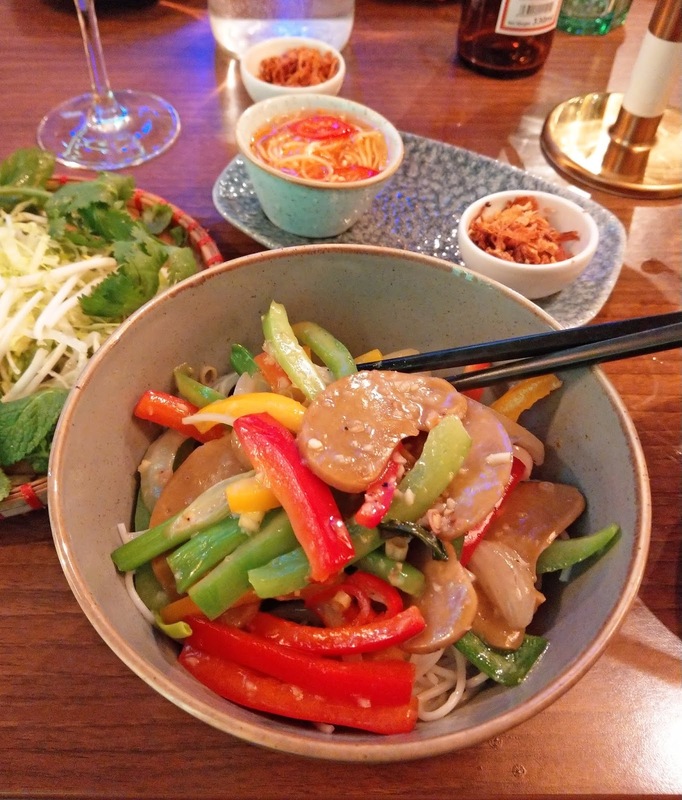 I had the classic noodles with two types of noodles, tofu, veggies and a tangy sauce and it did not disappoint - the noodles were packed with flavour and the sauce coated them perfectly. I would love to try some more Filipino food in the future and this was definitely a good place to start! This aptly named vegan business serves up their homemade tempeh and cheese-stuffed kimchi arancini. Focusing on fermented foods, it's no surprise how packed with flavour these arancini were, the oozy cheese in the middle was just incredible. 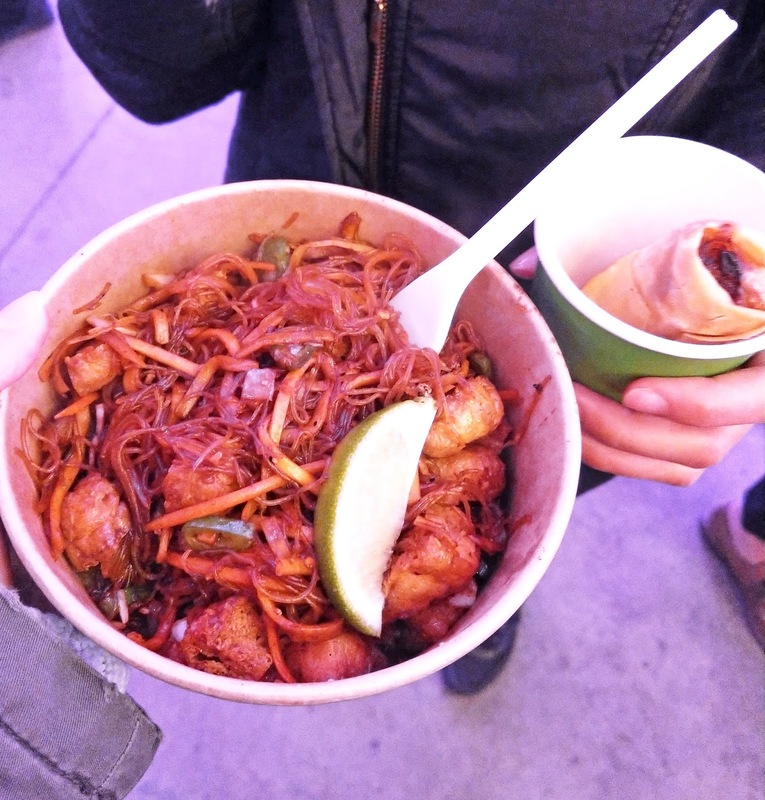 I tried these guys at Vegan nights, but they're at a number of markets, including the weekly House of Vegan market in Shoreditch, so come down and have a try! Specialising in vegan Chinese street food, pictured below is cha sui and chick'n shittake bao - they were so incredibly fluffy and the fillings were incredible. 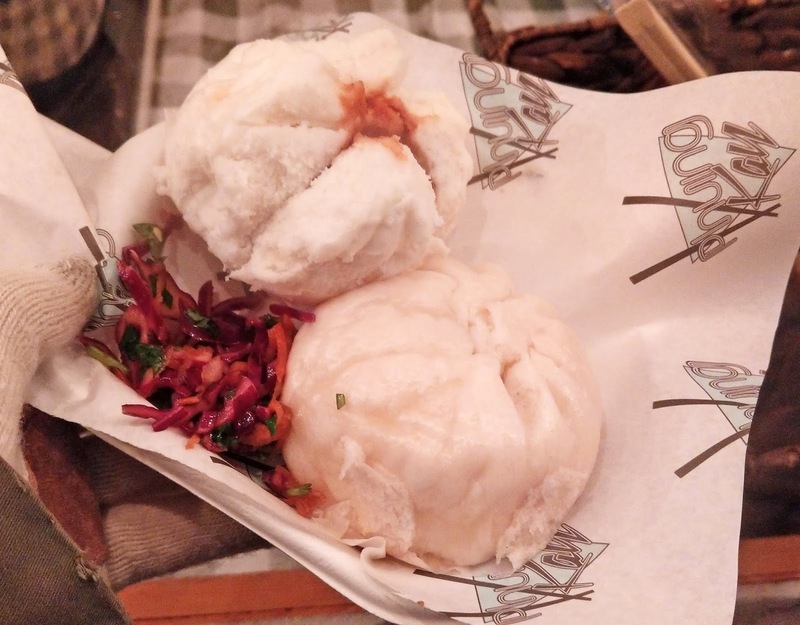 Little steamed pillows of goodness, I could eat these bao again and again! 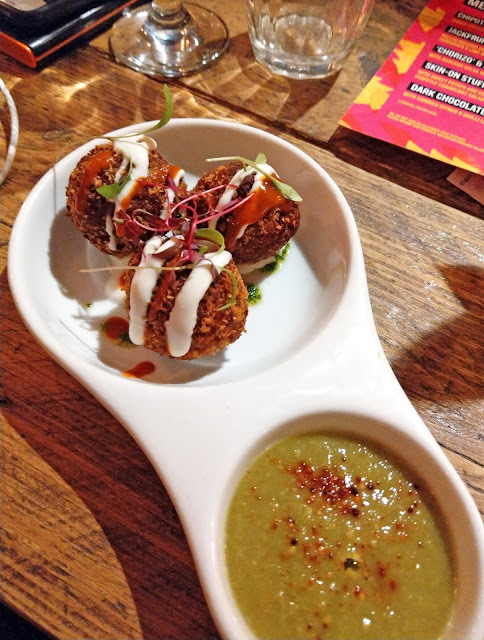 Serving up grub from Club Mexicana, this Homerton Pub is a great place for an evening hangout, 100% vegan, with a whole range of food and cocktails on the menu you can't go wrong. 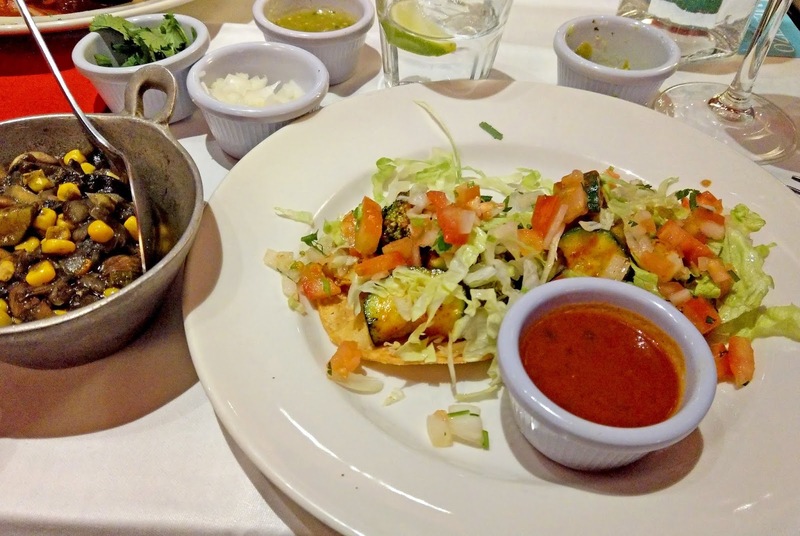 The picture below is from their Christmas tasting menu, but their burritos and nachos are something not to be missed with Club Mexicana. One of my favourite pubs, with a vegan-heavy menu that's promoted ahead of the meat options, serving up vegan versions of classic dishes like chicken burgers, truffle mac and cheese and Sunday roasts, as well as pancakes with vegan bacon for brunch. It looks like they were a fan of my picture below as it now features prominently on their website showcasing their chicken-ish burger. This Leyton pub has an upstairs hostel should you be visiting and also has a terrace for the summer. 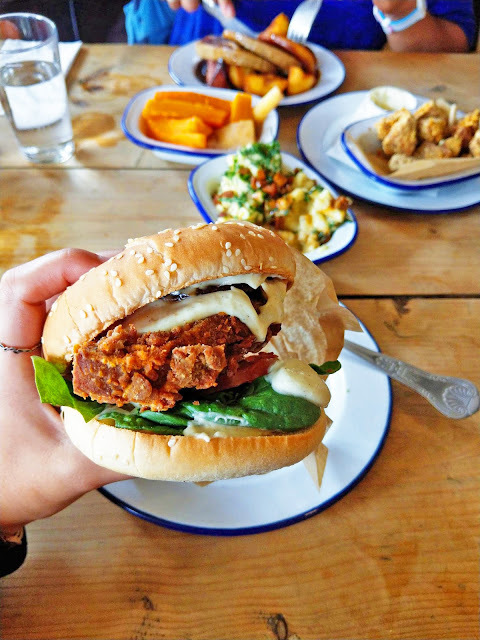 So grab some friends and head down to this pub, for some of the best vegan junk food in London (p.s. you HAVE to try their truffle mac). Currently between permanent locations, this Cypriot kebab business have a whole range of vegan options including thier tempeh kebabs pictured below. Other side plates include fries, gigantes plaki, dolma, crispy fried chickpeas, hummus and salads. 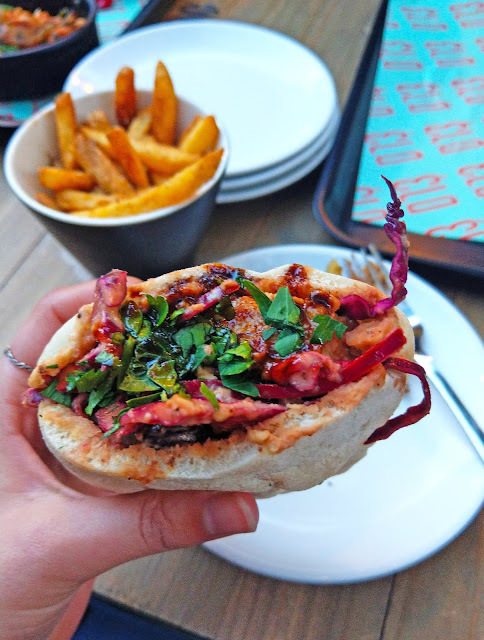 I tried Ela Kebabs during the summer during their residency at St Johns Brewery in Hackney, the food was full of flavour and perfect to share. A 100% vegan Italian restaurant in Bethnal Green, serving up fresh pasta dishes, crepes, flatbreads and desserts with a truly authentic Italian flavour. 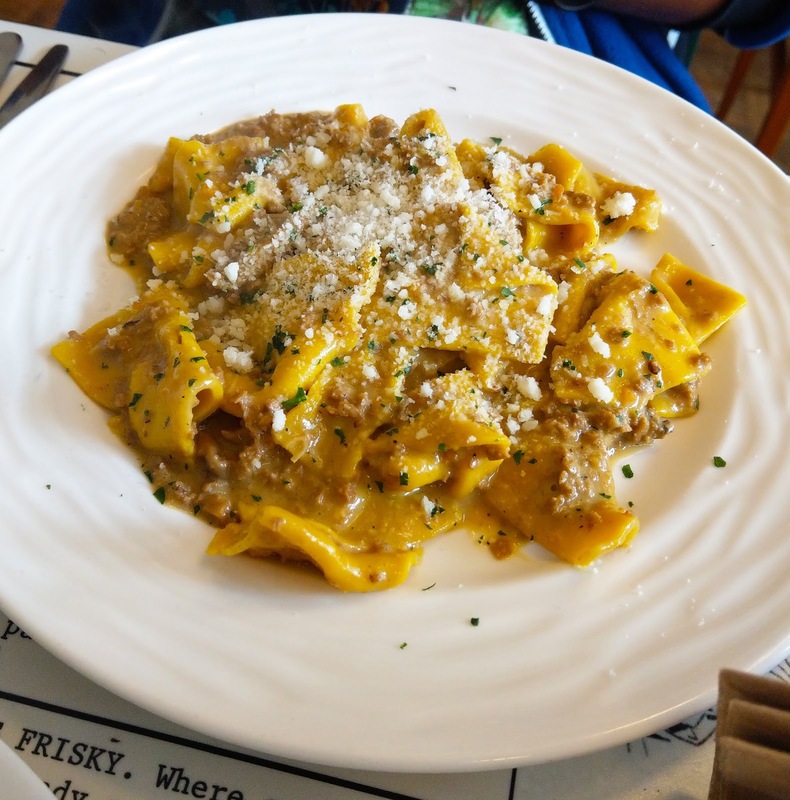 I visited with a friend and we shared a few things we ordered so we got to try more, the daily special of a white porcini bolognese was incredible, I've also heard good things about their regular bolognese. Antonios is open for lunch (Weds-Sun) and dinner all week, it's also BYOB, so book a table, grab a bottle of wine and enjoy some incredible food! With a number of locations around London, this veggie restaurant serves up a huge range of vegan eats; brunches, burgers, curries, pies, salads and desserts. 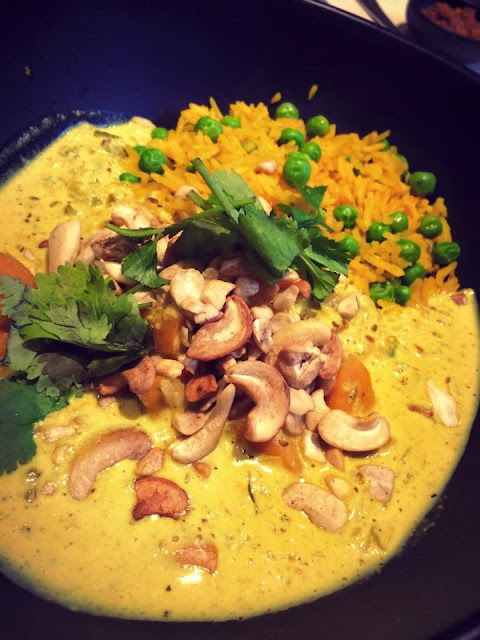 Pictured below is the Sri Lankan curry, which was absolutely delicious; the flavours perfectly balanced, served with lime cashews and pea basmati rice, I've also tried the tandori plate with a flaky roti, black daal and chutney. The food can't be faulted, I only wish you could book as it can get quite busy, especially the Soho and Kings Cross branches. 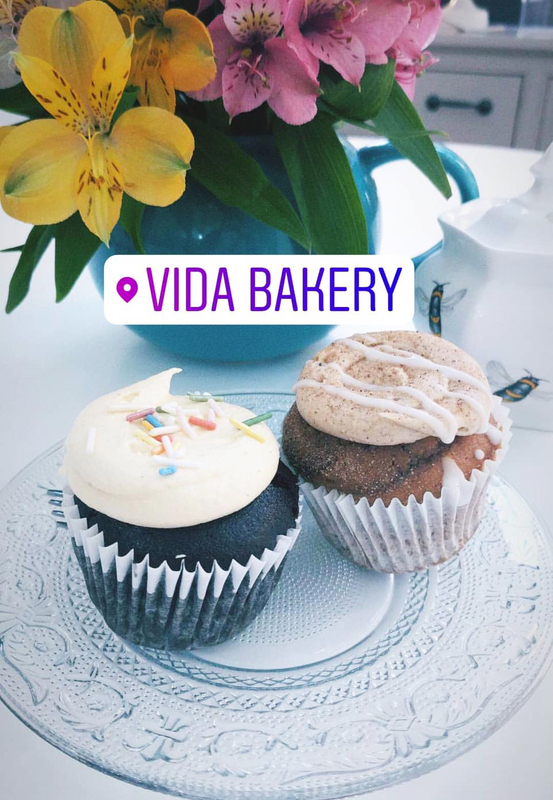 This Brick Lane bakery is 100% vegan and full of incredible treats, from rainbow layer cakes to cupcakes and cookies. It's a lovely place for a catch-up and be sure to take something away for later too! Picture below courtesy of my friend Mo as I forgot to take one when I visited. Not 100% vegan, but as you can see below this doughnut place has more than its fair share of vegan options. 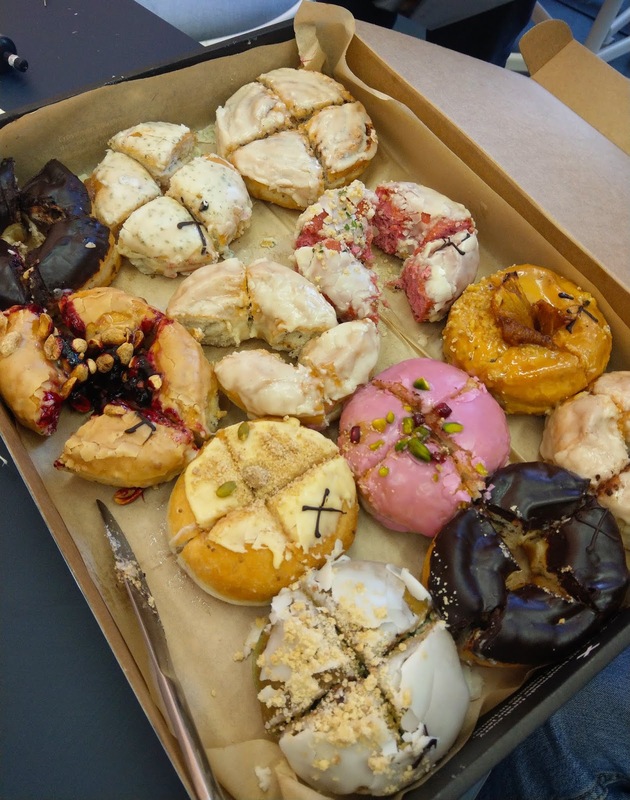 Below is a box we had at work, filled with fluffy delicious doughnuts like their peanut butter and jam, cinnamon swirl (my personal favourite), chocolate, tropical and so many more. There are crosstown stalls and shops all across London, so you're bound to have one near you! 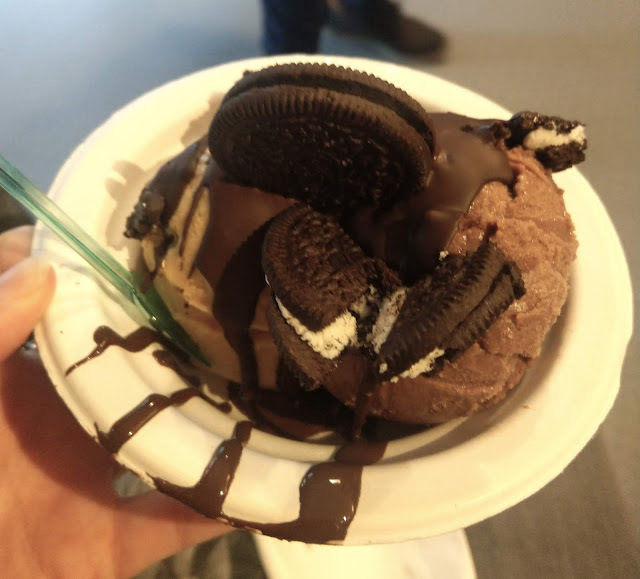 Located in the Shoreditch Boxpark, this bubble waffle shop has plenty of vegan options, including vegan bubble waffles (cooked in a separate machine) and icecream sundaes with a whole range of toppings to choose from! This 360 health establishment sells beauty products, moon milks (pictured below), CBD snacks and even has a basement sauna. It's not completely plant-based but there's plenty of vegan options to be tried. 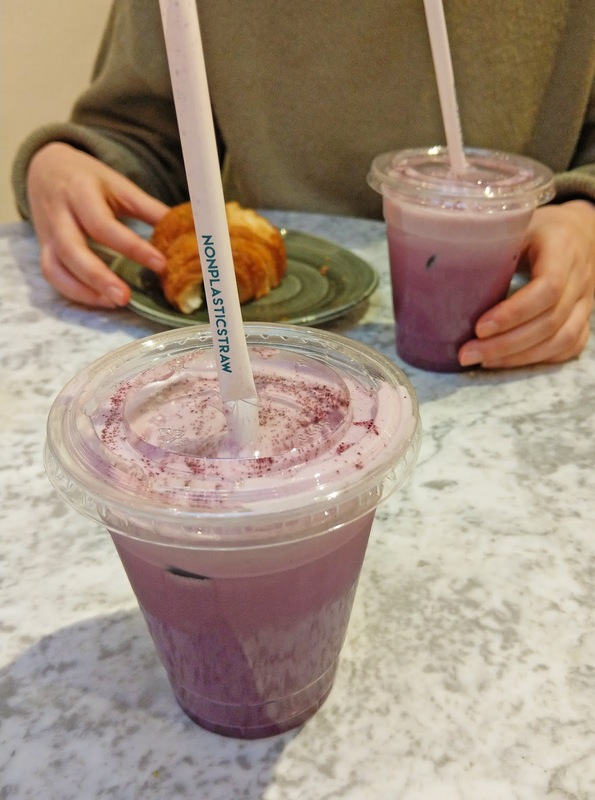 Pictured below is the Chill Moon Milk; macqui berry, ashwagandha and lavender, made with oat milk and served over ice. I left feeling super relaxed and calm, probably thanks to the lavender. My only gripe is the use of a non-plastic straw (great!) in a single-use plastic cup - we were sitting in the cafe, so I'd love to see places like this stepping up and providing reusable cups for their sit down customers and also a plastic alternative for their take-away ones. A vegan pizza place, complete with a whole range of toppings, like this pesto pizza with cashew cheese, courgette and mushrooms. Popping up at markets across London I tried Little Leaf at Soho vegan market. 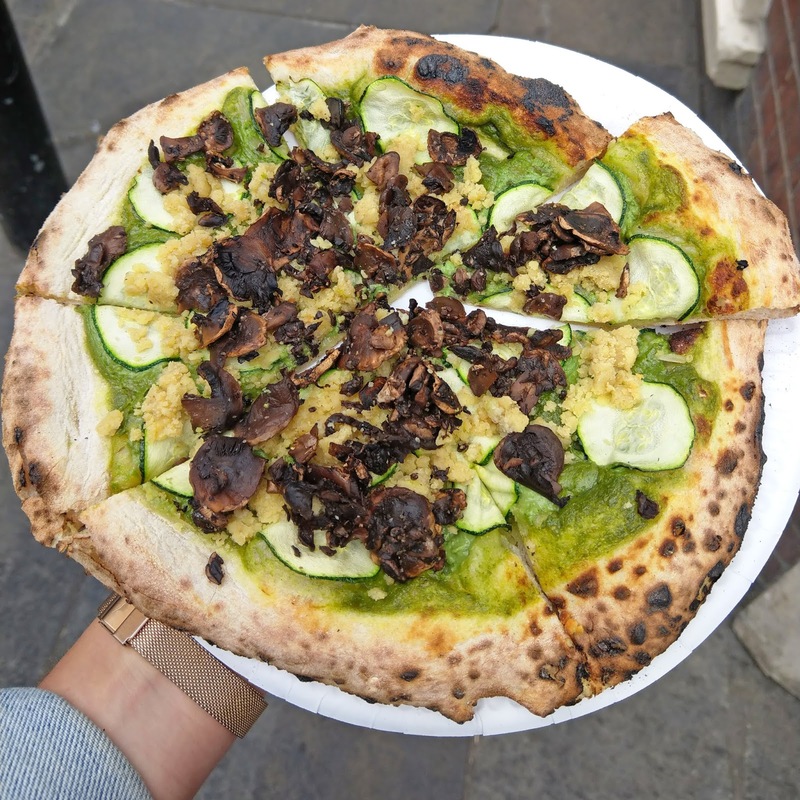 The dough was chewy, crisp and super authentic, the cashew cheese was tangy and salty and really balanced out the fresh veg and pesto sauce, I'd highly recommend trying these guys! 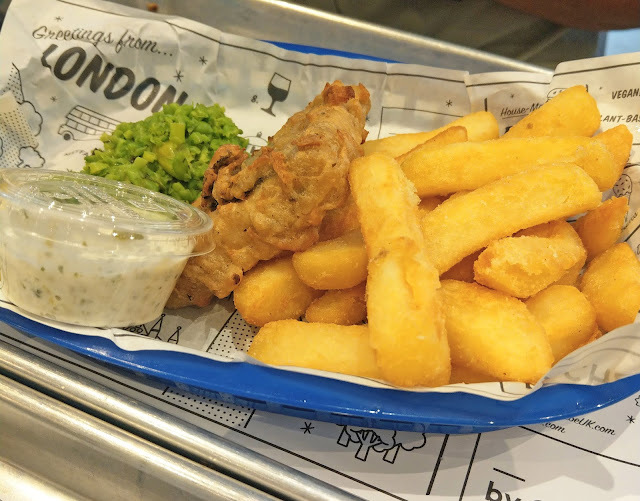 From New York to London, By Chloe is in 8 locations across the USA and Europe; the London branches have British specialties like tofish and chips with tartar sauce and mushy peas and the Royal Roast, finished with lashings of gravy and a vegan yorkie. I tried a few things when I went, including the mac and cheese and pesto pasta and was a little underwhelmed with them, but the tofish was super crispy, as were the chips and the tartar sauce really brought the whole meal together. If I'm being honest, wouldn't rush back to this place, but for quick, semi-healthy vegan fast food, it's not bad. This Malibu-inspired vegan establishment opened up in late 2018, just up from Tottenham Court Road tube station. They're serving up the legendary Moving Mountains B12 burger, as well as some salads, curries and desserts. I was pretty dubious about the B12 burger, I never liked red meat and I haven't eaten any in over 12 years so I thought I might find it a little too realistic but I was pleasantly surprised. The burger itself wasn't too tough or chewy and had a slight sweet bbq flavour to it which was more like processed meat (but I'm definitely not complaining about that! ), it was served up with crispy, chunky paprika chips and was thoroughly enjoyed by all of us. 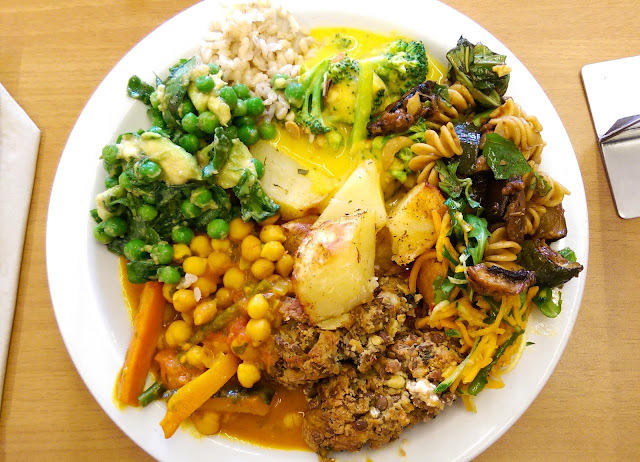 A pay by weight veggie buffet just off from Oxford Street, with plenty of vegan options. Pictured below is their seitan stroganoff, flatbread, za'atar roasted courgette, rice, chickpea salad, quinoa salad, Mexican salad and grilled corn. The buffet has a range of hot and cold options, as well as desserts, everything is labeled with allergens and whether it's veggie or vegan and the ingredients are also listed on the back of the labels for each dish, so it's super easy to navigate. The interior is spacious and elegant and I didn't worry for a second about leaving my things at the table whilst I went up for food. They take bookings, so if you're visiting on a weekend it's probably worth reserving a table. 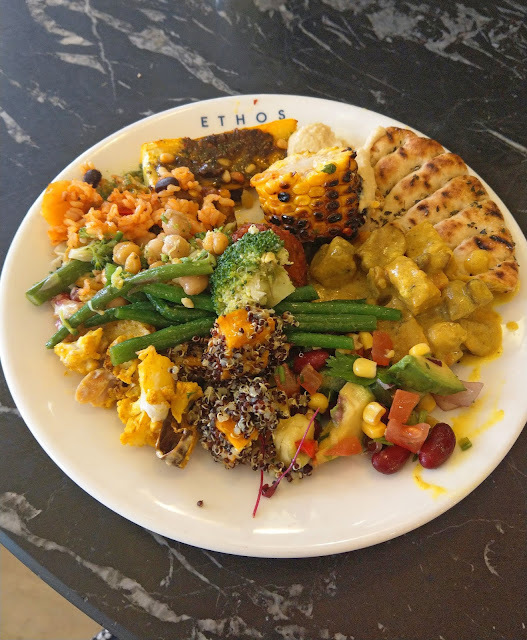 With a very similar concept to ethos, this veggie pay-by-weight buffet in Mayfair (plus a few other locations) has a whole range of vegan buffet options from hot dishes to salads, through to desserts. I love the idea of buffets like this and you get to try a whole range of delicious food, but I find them a little difficult logistically. When I visited it was really busy and despite there being two of us, it's always a little awkward as to whether you both go up, or if one person stays to look after the bags whilst the other gets their food etc. The picture below is from the Time Out website as it was very dark when we visited and I didn't get to snap one. I tried 222 3 years ago, it's a 100% vegan restaurant in Hammersmith, with a lunchtime all you can eat buffet and a la carte dinner service. The place is pretty tiny so be sure to book a table and dig in! There's not many all you can eat places left and especially not for under £10, when I visited the food was super delicious, with a mix of hot dishes and salad options and definitely worth a visit. I even managed to track down a picture from my visit back in 2015. This Soho based ice cream bar is pretty revolutionary in that it's free from all the major allergens, they don't even take cash to ensure there's no cross-contamination. 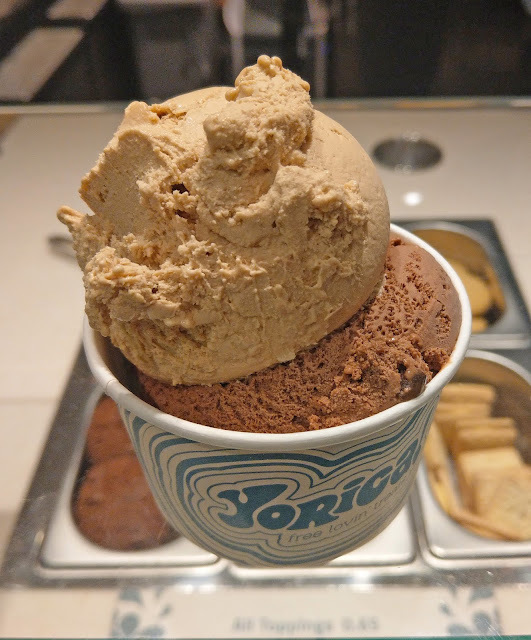 The range of flavours can be served up with sauces and toppings, they have hot waffles and crepes and soft serve too, so you can go nuts (not literally) in this place. Oh, did I mention, it's all insanely delicious too! They recently launched in Ocado, so wherever you are, you can have a taste of Yorika. 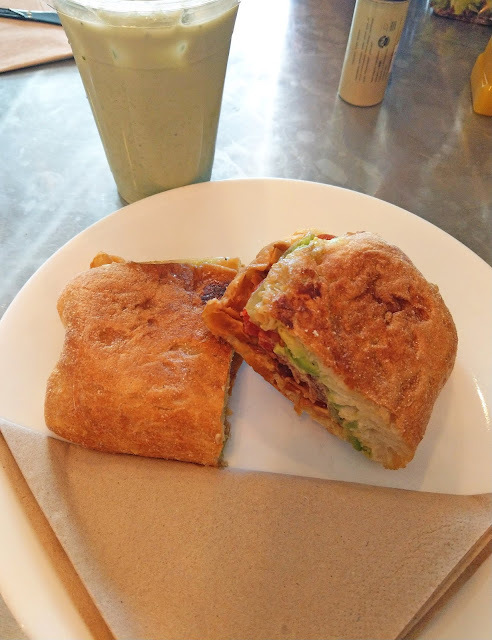 Juice baby in Chelsea, where I fell in love with coconut bacon. I didn't get it before, but the sweet, smoky salty flavour of these coconut flakes in this avo BLT was just incredible and I've been longing to go back for another taste ever since. The concept is like Pret, with lots of pre-made options, but that's where the similarities end, this plant-based cafe has so many unique healthy options that are all packed with flavour and texture - like the taco bowl, made with walnut mince or the soba noodle bowl - all their bowls also come with your choice of dressing. From juices to smoothie bowls and matcha lattes, this place is full of nourishing options that taste fantastic! Previously located at Borough Market (taking a break currently), this 100% vegan burger stand serves up patties made from mushrooms and other whole foods. Pictured below is their facon cheeseburger; the big V patty with tomato relish, burger sauce, red onion, vegan cheese and vegan bacon. 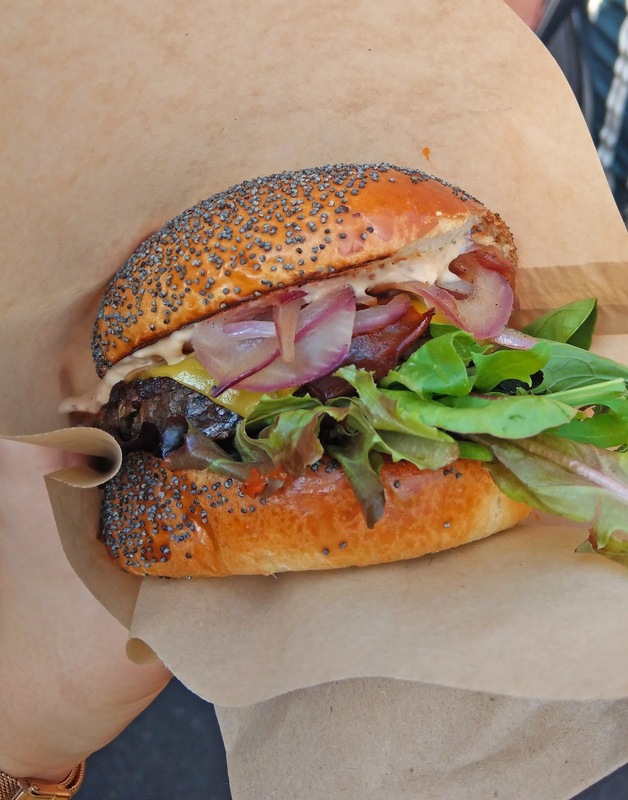 Keep an eye out for the return of these guys and in the mean time, take a look at that burger goodness below. If you visit Kew for the day, the great news is that there's plenty of vegan options in the eateries. Pictured below is the Sri Lankan curry from the Orangery, served with mixed grains. I also had a vegan chocolate chia pot for dessert, topped with raspberry coulis. Not only was I pleasantly surprised that there were vegan options, but they tasted incredible too! 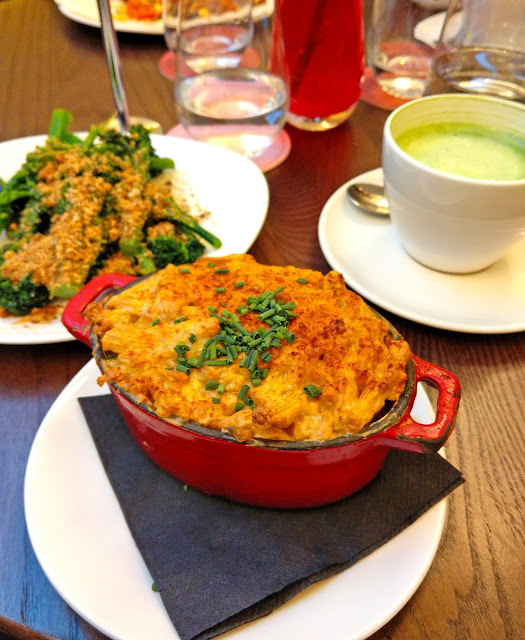 Wulf and Lamb, A vegan restaurant just off Sloane Square was another recommendation that had been on my list for a while, I'd heard that you couldn't miss the mac and cheese, so I had to have a try. The mac is on the sides menu, so I ordered it with a side of tenderstem broccoli, topped with porcini mushroom breadcrumbs. The Mac was so, so delicious, al dente pasta filled with a stretchy, rich cheese sauce, with the perfect sauce to pasta ratio, so you get sooo much cheese in each bite, the top was crispy and it was one of my favourite mac and cheeses that I've tried. The porcini breadcrumbs added a lovely flavour and texture to the mac and I just love my greens! Ordering a couple of sides, also left room for dessert below. Serving up incredible flavours of cashew-based ice cream, my first taste of Black Milq did not disappoint. 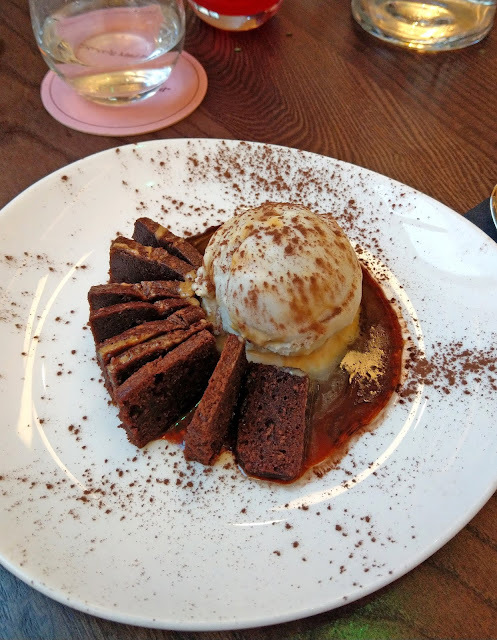 Below is their honeycomb and pinenut ice cream, served up with the peanut butter brownie from Wulf and Lamb, the ice cream was rich, creamy and had a wonderful mouthfeel and flavour. You can click and collect their ice cream in tubs from Hackney and they also feature at a number of markets, so keep an eye out! 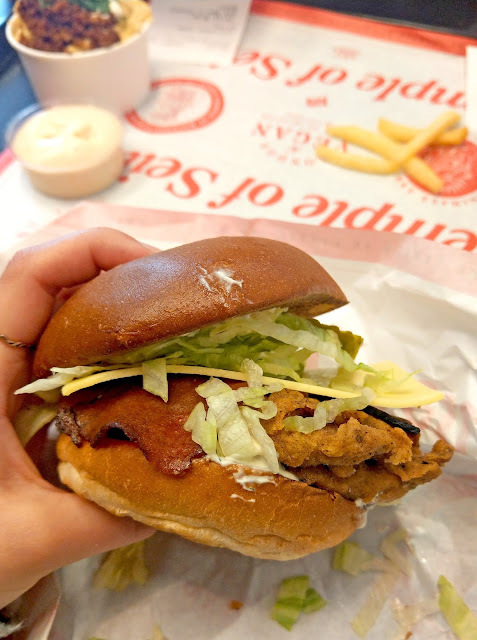 I've typically steered clear of the big chain restaurants in this post as they're not exclusive to London and most chains will also have plenty of vegan options for you to choose from. But, if you're looking for something a little more unique or personal to eat, I highly recommend checking out some of the places above. This post isn't sponsored in any way and I went to all these places on my own accord, by discovering them on social media and through recommendations! Also, just a little touch on nutrition, if it wasn't obvious, this isn't necessarily everyday food - it might have a little bit more salt or sugar, a little less veg or more calories than typical. I enjoyed most of this food over the course of a year and shared a lot of meals with friends (so I could try more menu options) and even so, we should never sweat about enjoying a slightly less healthy meal out. So eat your veggies, have a good balance most of the time and feel free to experience the crazy, incredible vegan food scene London has to offer us. Whether that be fake meats, salads, noodles, burgers or cake that you're in the mood for, have a read, pick and place and let me know what you think of it! 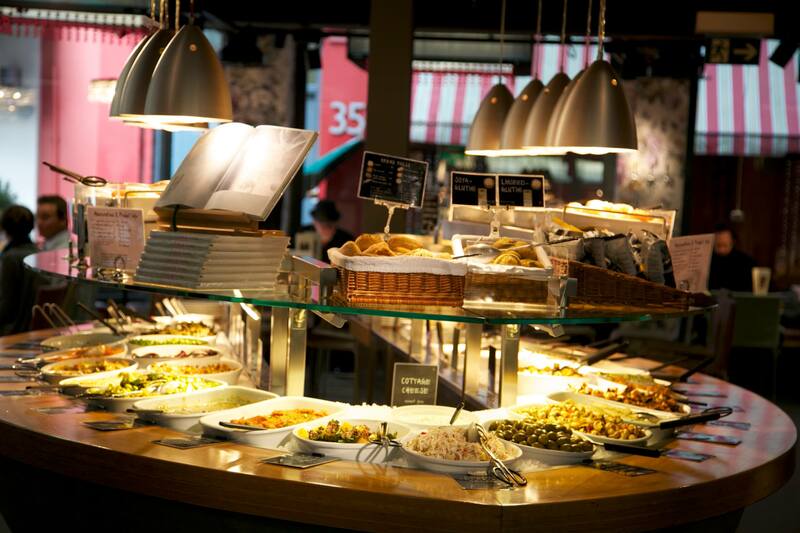 Where's your favourite place to eat in London? Please let me know in the comments below and I might just have to check it out! Places are tagged by establishment type and with multiple locations included.